Discount Magic - Inside Their Pockets Dvd Vol 2 Jacket Pocket Steal. Long coveted as one of the most difficult skills in magic, pick pocketing is now an obtainable feature for your show thanks to this DVD. 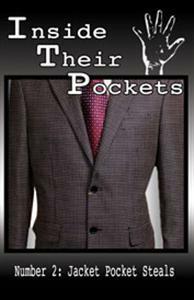 Jacket pocket steals made simple, taught concisely in under 15 min by Sam "The Gambit" Rubman! You'll learn how to remove a complete stranger's personal belongings such as wallets, phones, business cards. It's easy!